Just a short drive from both the excitement and attractions of the Pigeon Forge Parkway and the Great Smoky Mountains National Park, this cabin offer location that provides vacationers with the best of both worlds. 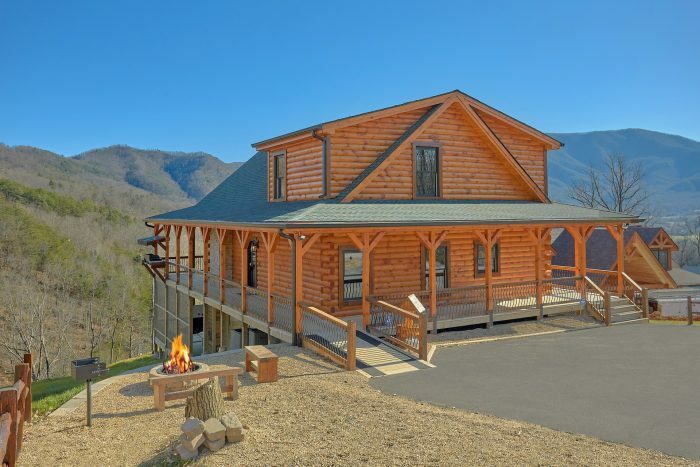 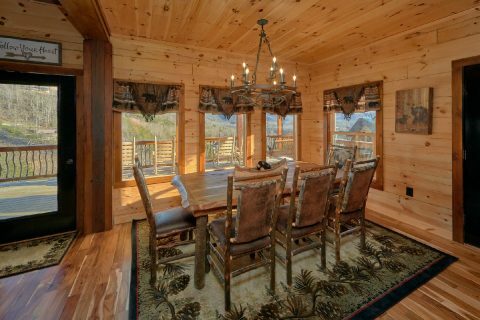 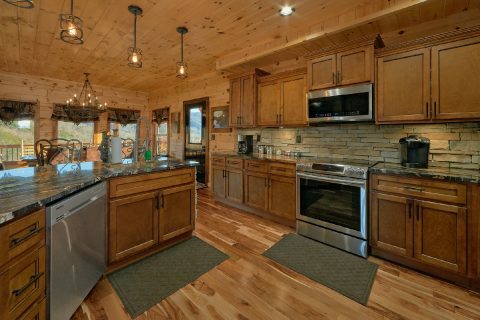 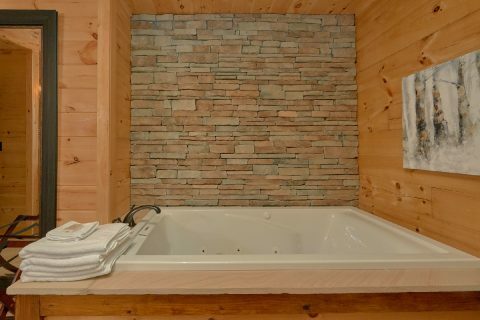 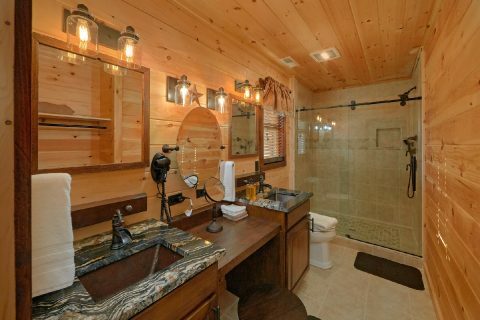 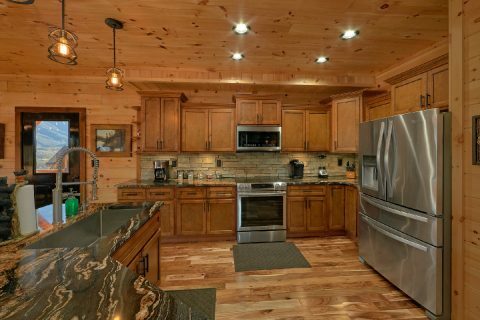 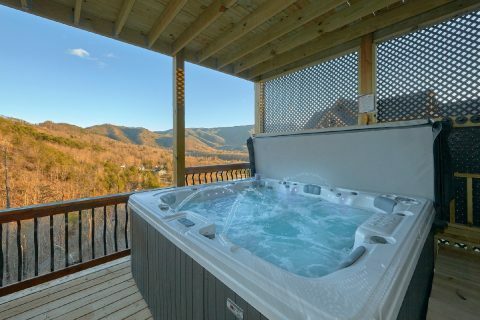 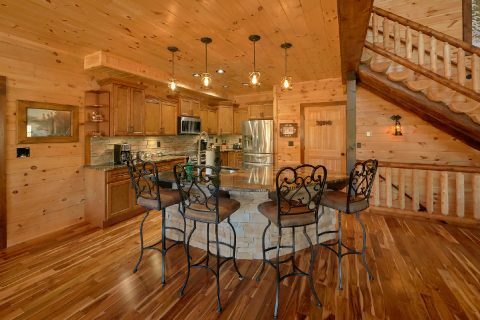 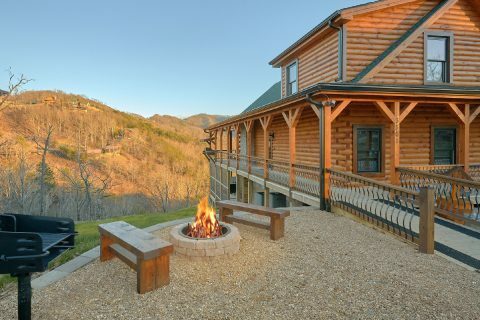 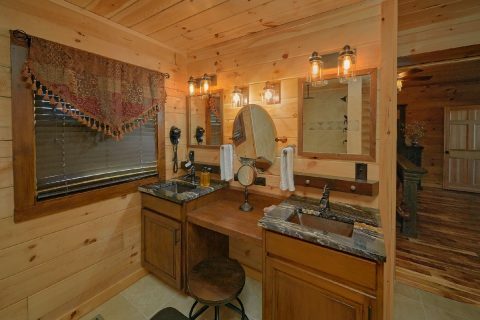 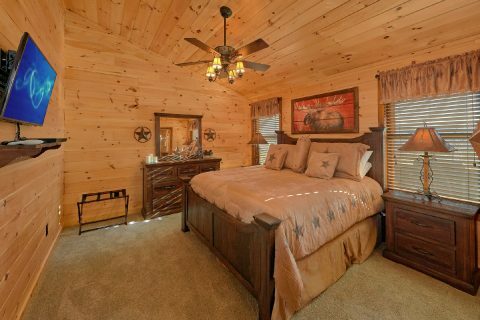 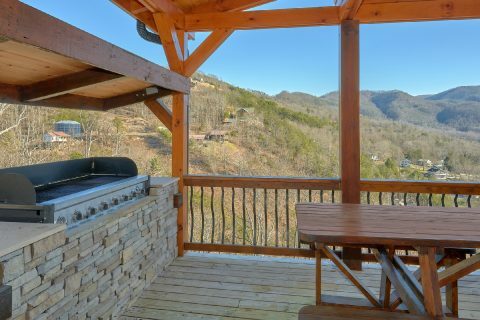 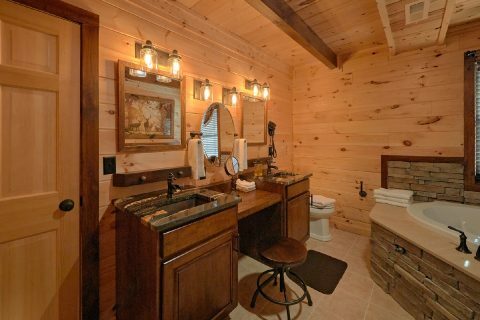 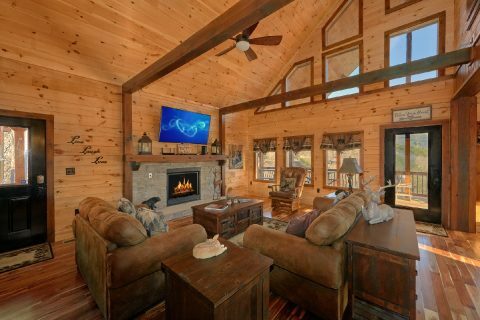 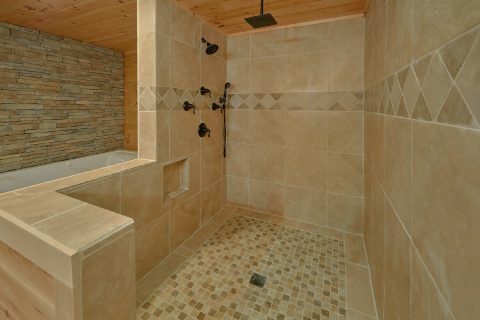 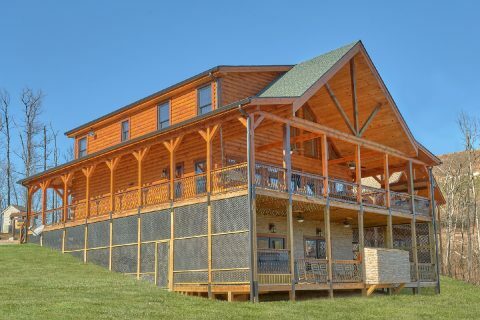 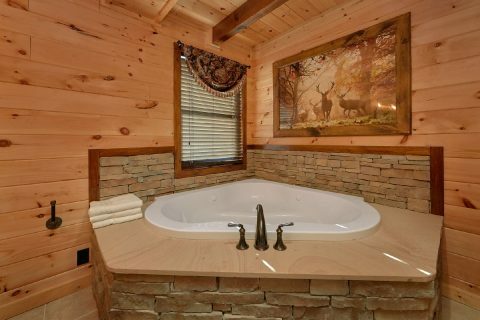 When you aren't busy shopping at The Island or hiking the trails of the Smokies, you can relax and unwind at you cabin with scenic view and luxury amenities. 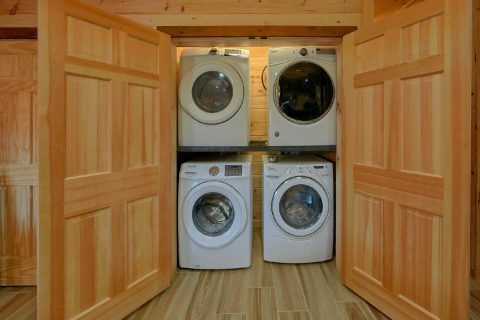 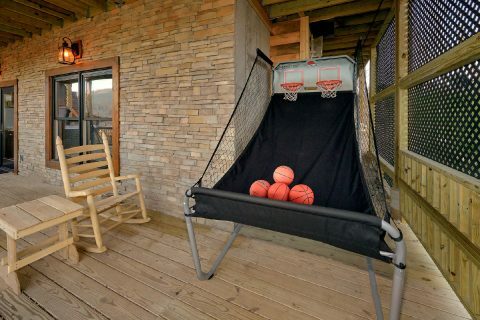 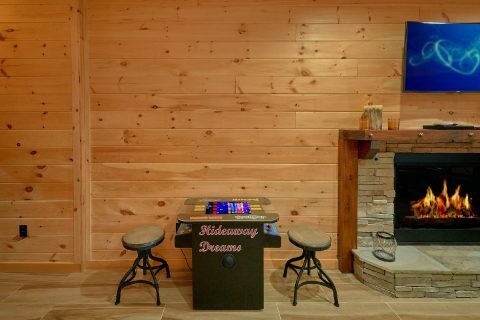 With a hot tub, a theater room, a game room, corn hole, and a basketball hoop in the driveway, there’s plenty to do inside and outside your cabin getaway. 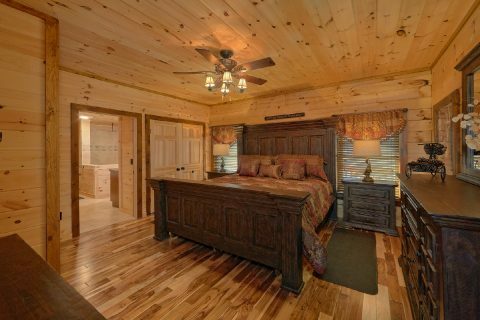 The main floor is home to a comfortable living area, a full kitchen, and a dining room where you can enjoy delicious meals during your stay. 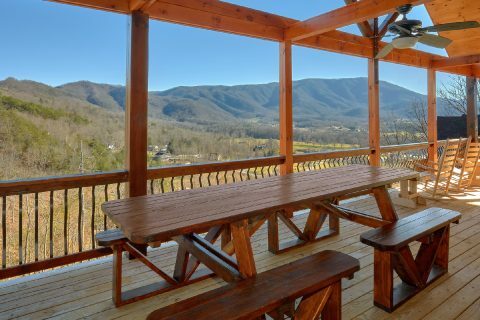 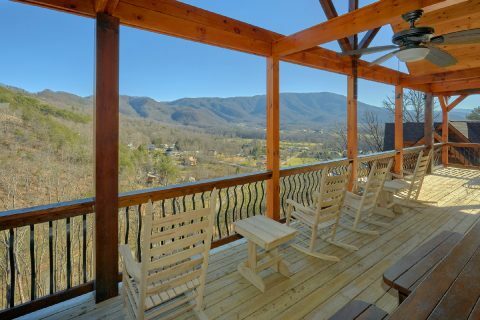 From here, you can always step outside to the main-level deck that boasts an impressive mountain view and offers rocking chairs, a built-in gas grill, picnic table, and a corn hole game. 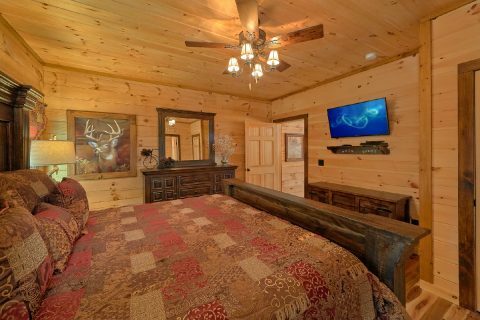 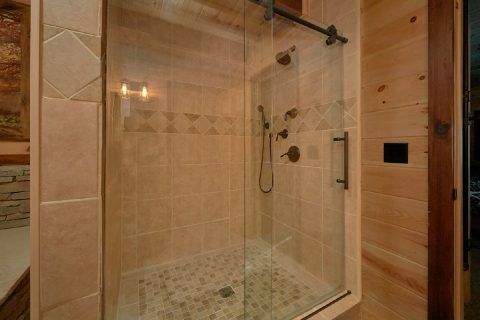 You’ll also find a wheelchair-accessible bedroom on this level with a king-sized bed and bathroom with large jacuzzi, roll-in shower, and a toilet with grab bars. 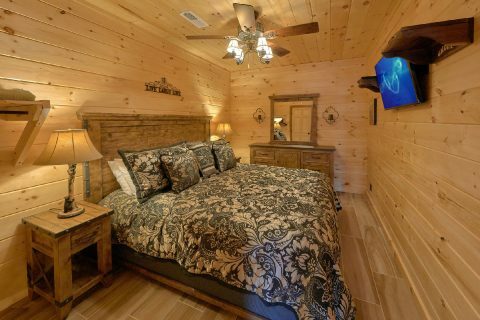 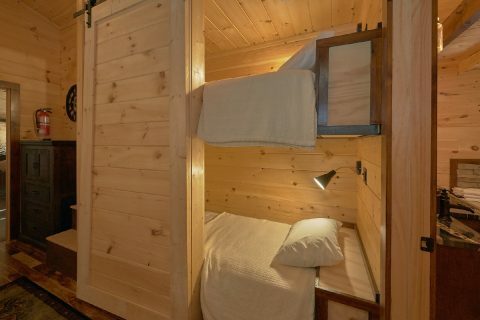 Sleeping up to 12 people comfortably, the cabin’s three other king bedrooms which boast 47-inch TVs and full baths. 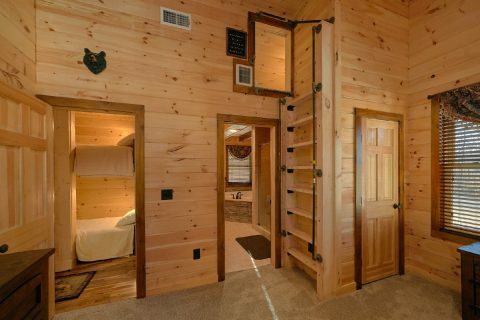 Upstairs, you’ll find 2 king bedrooms as well as two cubby areas with twin beds that are perfect for kids and teenagers. 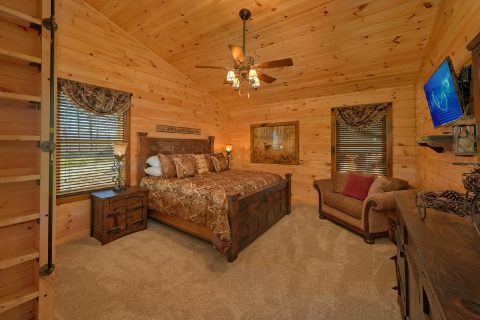 The fourth king-bedroom is located on the bottom floor, providing plenty of space for all your guests. 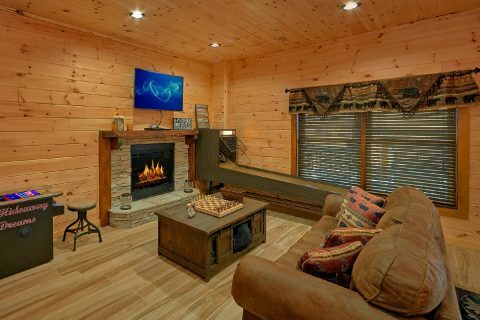 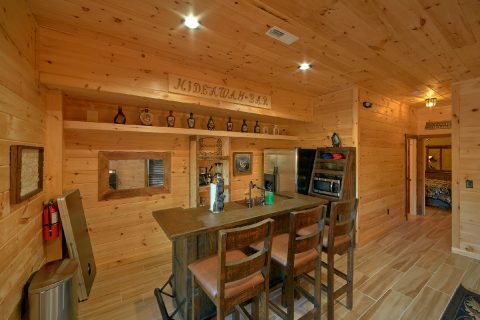 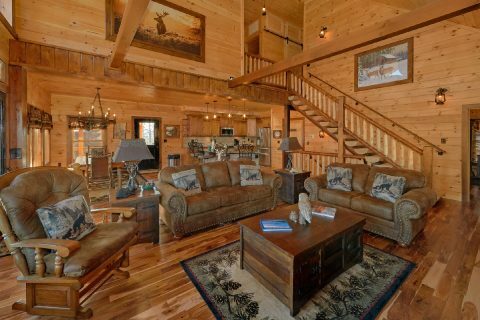 Two of the highlights of this luxury 4-bedroom cabin is its game room and theater room located on the bottom floor as well. 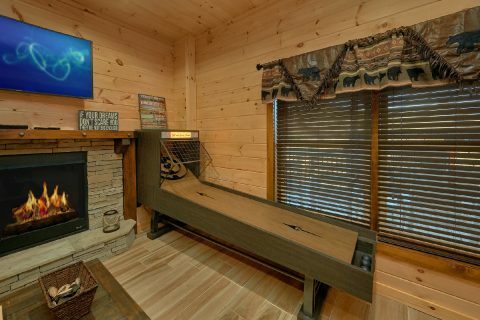 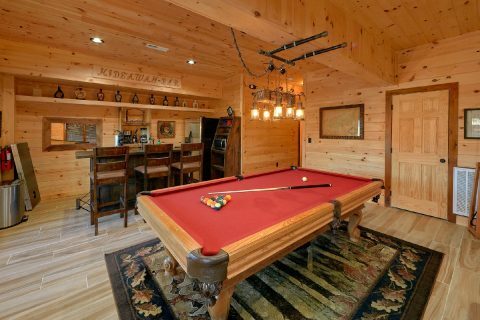 In the game room, you can enjoy a pool table, skee ball, arcade game, board games, and a wet bar. 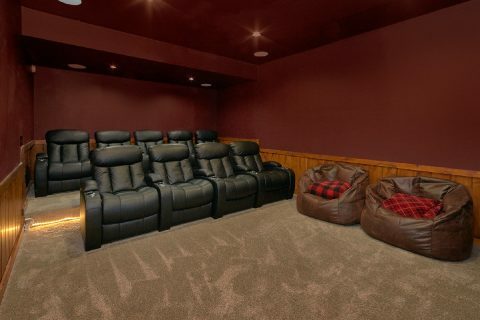 The theater room offers everything you need for movie night in with 9 theater seats, surround sound, a Blue-Ray DVD player, karaoke machine, and an 82-inch TV. 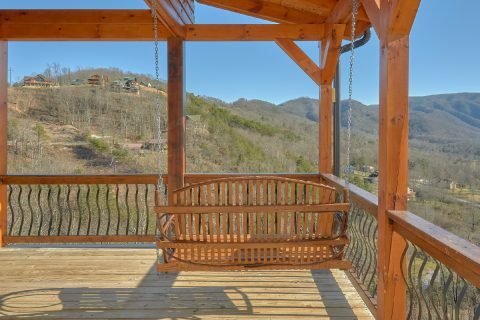 With scenic views and ample entertainment options, “Hideaway Dreams” offers everything you need for a memorable getaway to the Smokies.